The University of Brighton is hosting an exhibition and seminars at a global design and build show dedicated to promoting sustainability and slashing waste. Ecobuild 2018, the largest free-to-attend show of its kind in the world, runs from 6 March at ExceL London and comprises three days of talks, presentations, workshops and debates engaged with waste as a global issue. 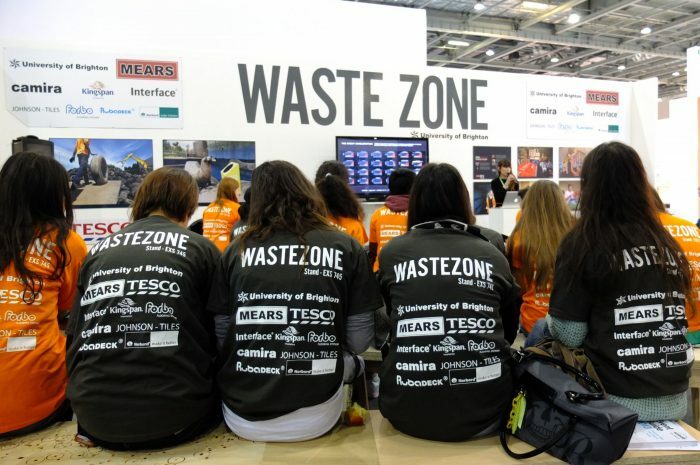 Responsible Futures – the University of Brighton’s research-focused initiative aimed at encouraging sustainable economic growth, improved environments and more inclusive societies – is supporting the University’s ‘WasteZone’ symposium and exhibition. Curated by architect and Senior Lecturer Duncan Baker-Brown and Principal Lecturer Nick Gant, from the School of Architecture & Design, WasteZone will see over 20 speakers from across Europe and the US discussing innovative design solutions aimed at cleaning up waste and working with new materials that will one day turn into compost. Mr Baker-Brown, environmental activist and author of ‘The Re-Use Atlas: a designer’s guide towards a circular economy, said: “A true circular economy requires the re-design of systems, services, new materials, products, buildings; whole cities even – Ecobuild brings global focus these issues and the pressing need for all of to act now to safeguard our precious resources and protect our threatened planet. Cat Fletcher will speak on ‘We really need to talk about over-consumption’. She said: “Not only do we need to redesign things for repair, durability, and easy recycling, and escalate delivering circular economy friendly infrastructure to get us out of a poisonous polluting linear economy, we also have to face the reality that we simply make too much pointless stuff and that has got to stop. Seminars can be attended by anyone with an Ecobuild ticket with no prior-seat booking. Spaces will be given on a first-come first-serve basis at each theatre. This entry was posted in Construction, Events, Life at Brighton, News, Uncategorized.